In the middle 1870s the French engineer Henry Pottin patented the first key-set crank operated machine and made first attempt to record the items in addition. 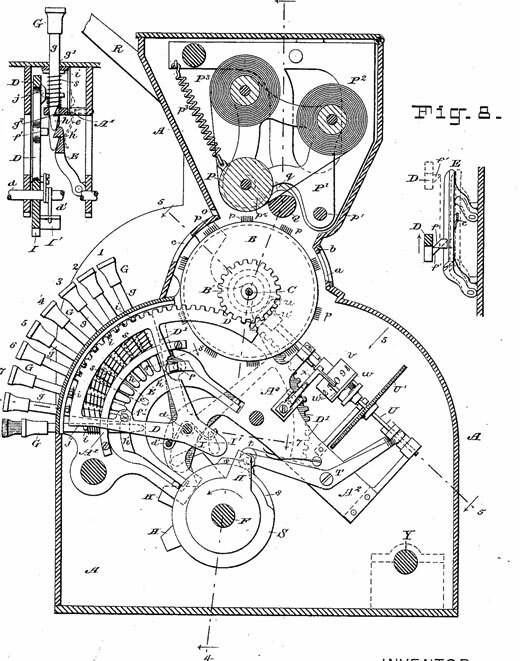 The Pottin invention implemented two of the prime principles of the first workable recording-adders; one is the depressable key-set feature and the other is the recording of the numerical items. 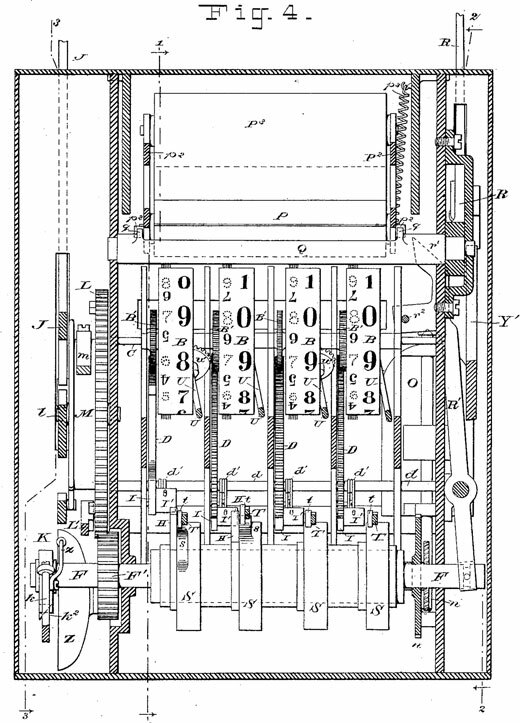 The Pottin machine was the first known depressable key-set crank-operated machine made to add columns of figures and the first machine in which an attempt was made to print the numerical items as they were added. The Frenchman Henry Pottin was a holder of more than 20 patents in USA, Canada, France, Great Britain and Germany from the end of 19th and beginning of 20th centuries, mainly for cash registers and other recording and registering machines, but also for a billiard table (US patent No. 175495 from 1875), weighting scales, vending machine, etc. Almost nothing is known about Henry Pottin. From the patent applications is clear, that he was a civil engineer, and spent most of his life in Paris, France. In his first patent from 1875 he was specified as living in Philadelphia, Pennsylvania. In the other patents he was specified as a French citizen, resident of Paris. Let's examine the device, using the patent drawings of the pat. No US312014 from 1885 (see the both sheets with drawings below). There are four large wheels shown, marked B. These wheels are what may be called the type-wheels, although they also serve as indicator wheels for registering cash sales. The type figures are formed by a series of needles fixed in the face of the wheels. Referring to Fig. 1, it will be noted that to each type-wheel is geared a spring-actuated segmental rack marked D, which, as shown in the drawing, is in contact with a pin marked i, which protrudes from the side of the depressed number (9) key. The normal position of the rack D is indicated in dotted lines showing the next higher sector which has not been displaced by key depression. Each key, as will be noted from Fig. 7, is provided with one of the pins i, which is normally out of the path of the lug j, as the racks D, drop forward; but when any key is depressed the pin is presented in the path of the lug j, and stops further forward action of the rack. It will be noted that the arrangement of the keys is such as will allow progressively varying degrees of action to the segmental racks D. This variation, combined with the geared relation of the type-wheels and racks is equivalent to a tenth of a rotation of the type-wheel for each successive key in the order of their arrangement from 1 to 9. The means provided for holding the segmental racks D, at normal, also serves to hold a key of the same order depressed, and consists of a pivoted spring-pressed latch-frame marked E (see Figs. 7 and 8). With such a combination, the depression of keys in the several orders will unlatch the segmental racks, and the racks, through the tension of their actuating springs, will turn the wheels and present a type corresponding to the numerical value of each key depressed. A hand lever, marked R, located on left side of the machine provides power for printing the items. Another hand lever, marked J, serves to restore the segmental racks, type-wheels and the keys to normal, and through the cooperation of the lever R, adds the items to the totalizer numeral wheels, which are shown in Fig. 1 as the numbered wheels marked v.
The paper is supplied from a roll mounted on a hinged platen frame P1 supported in its normal position by a spring P3. The paper passes under the roller P, which acts as a platen for the impression of the type. A shaft Q, passing under the frame P1 is fast and rigidly connected on the left-hand side of the machine with the hand lever R, and acts as a pivot for the said lever and by means of lateral projections q, serves when the lever R is operated to engage the frame P1 and depresses it until the needle types have pricked the numerical items through the paper. A slit in the casing provided means for printing the item on a separate piece of paper or bill. Although there is no means shown by which the paper is fed after an item is printed, it is claimed in the specification that the well-known means for such feeding may be employed. The actuating lever J referred to, is connected by a ratchet and geared action with the shaft F*, so that a revolution is given the said shaft each time the lever is operated. To the shaft F, (see Fig. 1) is attached a series of arms H, one for each order, which, as the shaft revolves in the direction of the arrow, engages a lug marked I, on the segmental racks D, thus rocking the segments back to normal, turning the type wheels with them. The return of the segment racks D, cause the back of the latch tooth f1, (see Fig. 8) to engage the latch tooth f, of the latch bar E, camming it out of engagement with the keys so that any key that has been set will return by means of its own spring. The total or accumulator numeral wheels are connectable with the type or indicating wheels B by an engaging and disengaging gear motion set up by the combined action of the hand levers R and J, which first cause such gear engagement, and then, through the return of the type wheels to zero, turn the accumulator wheels, thus transferring the amount of the item set upon the type wheels to the accumulator wheels.